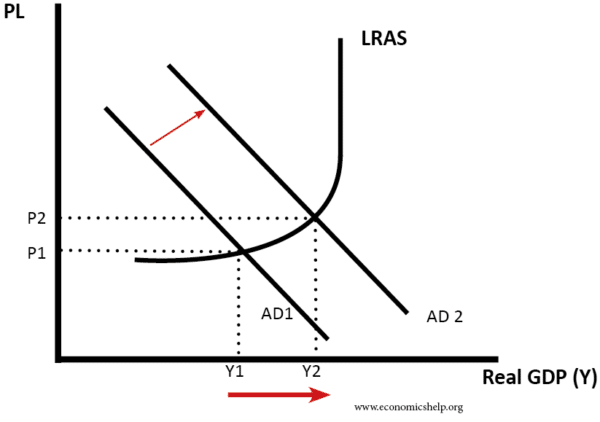 How does the minimum wage affect aggregate demand/aggregate supply and macroeconomic factors such as inflation, unemployment and economic growth? A minimum wage is the statutory minimum wage that employers can pay per hour. In 2018, the UK minimum wage was set at £7.83 an hour for workers over 25. Higher wages increase incomes and potentially cause higher consumer spending. However, there is a danger a minimum wage can cause higher unemployment, which would cause lower economic growth. If workers receive a pay increase, then there will be a rise in consumer spending. Low-income workers are likely to have a higher marginal propensity to consume (in other words they spend high % of extra pay). This could also cause a multiplier effect, with higher spending causing knock-on effects to elsewhere in the economy; this should help boost economic growth. However, if we assume labour markets are competitive and if we assume that a minimum wage does cause lower employment, then rising unemployment will have a negative impact on aggregate demand. People who become unemployed would spend less, leading to lower aggregate demand. It is debatable whether a minimum wage actually causes unemployment. In period 2010-17, UK unemployment has fallen to 4.5% – despite increases in the minimum wage. Therefore, overall, the higher minimum wage in this period has probably had a positive impact on aggregate demand – especially given how real wage growth has been low and consumer spending weak. Even modest rises in the national minimum wage make a big difference to disposable income and contributed to higher spending. Higher wages enable higher consumer spending and a rise in AD. From the perspectives of firms, an increase in the minimum wage would increase their costs of production. Also, not only will firms have to increase the wage of workers on the minimum wage, but if they seek to maintain wage differentials – they may need to increase wages of more qualified workers – earning just above the minimum wage. In this case, a minimum wage could lead to firms passing wage rises onto the consumers in the form of higher prices. 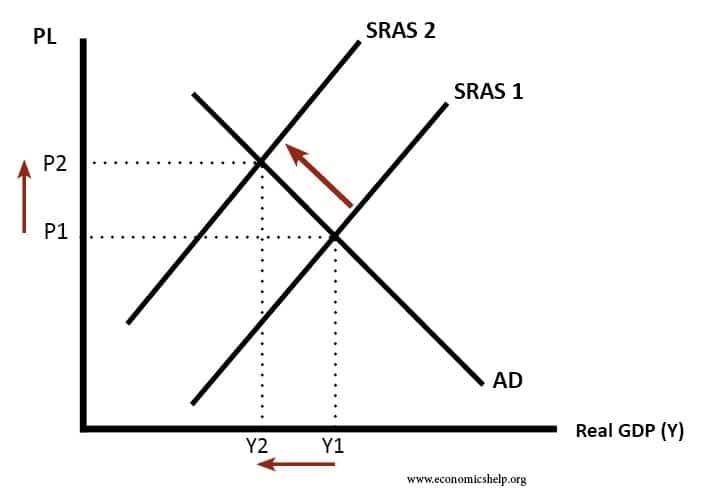 This will cause SRAS to shift to the left and higher inflation. Also, if higher minimum wages leads to an increase in consumer spending, it could cause a degree of demand-pull inflation as well. Higher costs for firms, leading to wage-push inflation. However, in reality, the inflationary impact of a rise in a minimum wage is likely to be muted. As a percentage of a firm’s overall costs, the minimum wage bill is only a small component. Also, given the low inflationary pressures, there is also a pressure for firms to absorb the wage increases without increasing prices (reduce profit margins). Also, in theory, firms could respond to higher minimum wages by investing in capital to raise labour productivity and so will be able to afford the higher wages – without increasing prices. 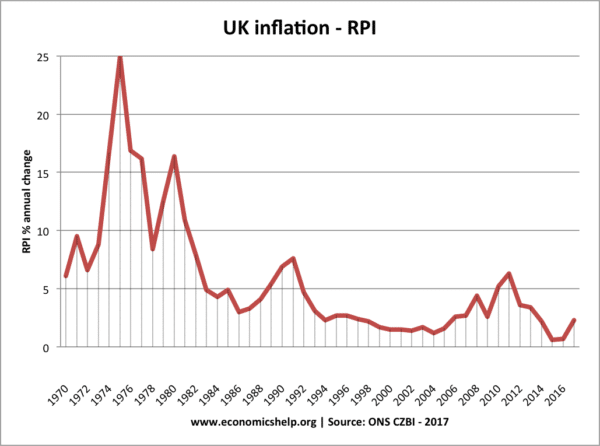 UK inflation since 1997 has been low. 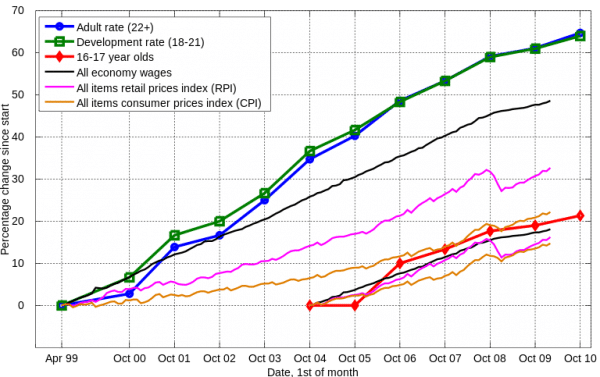 The spikes in 2008-11 were due to cost-push factors (oil prices, devaluation) not rising wages. In the real world, I think a minimum wage would have only a marginal impact on AD/AS analysis. Firstly, a minimum wage may not cause any unemployment. Labour markets are not perfectly competitive but have a degree of monopsony power. Demand for labour may be wage inelastic. Firms just pay higher wages and there is little fall in demand. Only one in twelve workers are affected by a minimum wage. (though the percentage of workers impacted by the minimum wage is forecast to rise as the minimum wage is set to rise. If anything, I would expect a minimum wage to increase AD – with a higher NMW some workers would receive higher real income and spending would rise. I’m doubtful, given recent experience, that the UK Minimum wage causes any significant levels of unemployment. Though if it was increased to £10, this might need to be revisited. Overall, the effect on inflation would be fairly limited because a minimum wage would only alter AD by a small amount. Source Splash, Wikipedia, CC, SA. 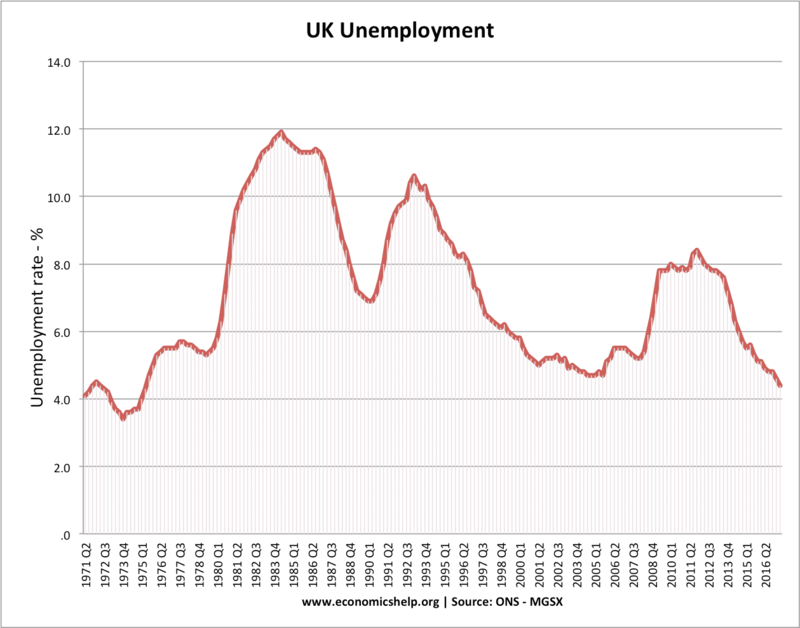 Unemployment in the UK. The minimum wage was introduced in 1997 when unemployment was around 6%. There was a sharp rise in 2008-10 due to the great recession. But, has fallen sharply since 2012 – despite weak growth and increased national minimum wage. The UK rate of unemployment at 4.5% is the lowest since the 1970s – suggesting the UK has a lower natural rate of unemployment. Many factors affect employment apart from minimum wages. But, there is little evidence to suggest increasing minimum wage 60% since 1997 has led to a significant rise in real wage unemployment. This entry was posted in labour markets and tagged wages. Bookmark the permalink. What is not factored in this article – or any article – is the degree to which a certain area of employment is very labour intensive and limitations on improved automation. For example with manufacturing there’s the possibility of increased automation to keep the cost of a item down and therefore minimising the effects of a high minimum wage. But with care of the elderly – front line face to face care involves an actual person. There’s quite limited scope to reduce this. And is reducing it a good thing? As the minimum wage gets higher and higher – as it has – the cost of care will become prohibitive with currently little chance of significantly saving costs through automation. It means a lot of vulnerable elderly people having to fend for themselves as they won’t be able afford the cost of care. 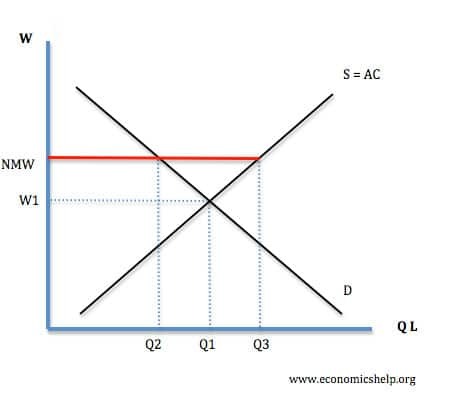 Ofcourse,minimum wages causes unemployment,but it depends on companys’ demand of of labour elasticity.If labour is inelastic than efew workers will loss their jobs,rather than if its labour demand is elastic ,means it has substitute factors to use as factor of priductions.In reality minimum wages are badly if there is no other market failures such as: labor exploitation,employers have most advantage /profit,what do we call dispropationate factor price.At that time there must be intervention to reduce income share distortion,by under pricing capital owners and over pricing labor wages.